Adriana Garcia 11, pictured with a gray tree frog, is conducting research on a fungus that is devastating the coqu, a tiny brown frog species native to her home territory of Puerto Rico. When Adriana Garcia '11 transferred to Cornell last year from the University of Puerto Rico, she was thrilled to find that one of her professors was working on a fungus that has been devastating one of Puerto Rico's iconic treasures, a tiny brown frog with an outsized singing voice known as the coquí. Loved across the island for its all-night lyrical chirping, the songs have been growing a little quieter in recent years. The fungus, Batrachochytrium dendrobatidis (Bd), which has been linked to massive declines and even extinctions in some amphibians around the globe, also has been taking a serious toll on the coquí population. 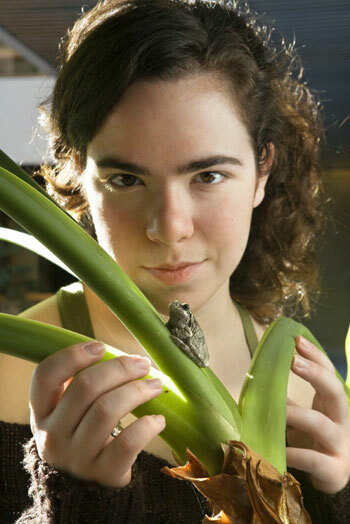 Garcia, who had learned about the fungus in a biology class in Puerto Rico, wanted to be involved in research that would help reverse the coquí calamity; so when she transferred to Cornell, she sought out ecologist and evolutionary biologist Kelly Zamudio, who was working on Bd in her Corson Hall lab. Today, Garcia spends much of her time in Zamudio's lab researching the pathways of the fungus's amphibian destruction. In doing this, she has joined hundreds of undergraduates across the campus whose college academic experience is as much about doing original research as it is about lectures and coursework. "Research is an essential part of my life. I find it crucial to study current changes affecting biodiversity," she said.